I Would Love To Go On A Colorado River Adventure Again!!!!!! My Colorado River trip ran from May 7-12, 2013 and in my opinion a perfect time period, not too hot or too cold. 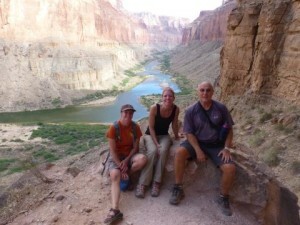 When booking my Grand Canyon trip, Western River's ad appeared to be the best presentation, and I was not disappointed! We floated with two rafts, the four guides were superb, well trained, friendly, well informed and the best chefs to be found anywhere! The "J" rig raft design is the best one on the Colorado River. Lots of room to move around. Riding the front tubes was the ultimate position when going thru the white water. Everyone took turns in all the locations. The "Princess Suites" near the middle gave people a chance to dry out. The quality, quantity and the preparation of the food was as good as any 5 star restaurant. I could go on and on about the food but having HARD ice cream with desert on the fourth night out and shrimp cocktail as an appetizer on the last night gives one a hint about the rest of the meals. 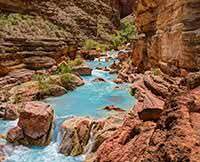 I have seen the Grand Canyon from both rims but seeing it from the river is a must. If riding white water is on your bucket list, the Colorado River gives you more than you expect. I am a fit senior and age was not a barrier to enjoying everything I encountered.